3 Garnets & 2 Sapphires: Residence Inn by Marriott . 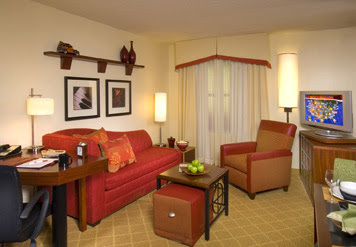 . . Redefining the Words "Hotel Room"
Residence Inn by Marriott . . . Redefining the Words "Hotel Room"
From my past experience, a standard hotel room has one queen size or two full size beds, a television armoire, and a small table with two chairs. The Residence Inn by Marriott has reinvented the hotel room. A room at the Residence Inn, whether your extended stay is for business or a family vacation, resembles an apartment rather than a hotel room. Each room comes with a living room, which includes a sleep sofa, and a full kitchen, complete with a microwave, stove or cook top, a dishwasher, refrigerator, and eating area. In addition to spacious apartment-like hotel rooms, the Residence Inn also offers daily hot breakfasts, free in-room Internet access, a pool, and a place for children to play outdoors. Another great feature is privacy . . . something you cannot have while staying with friends or relatives. 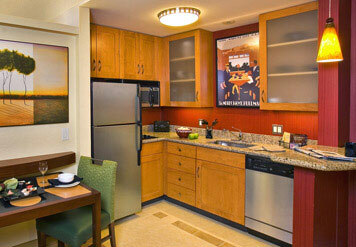 Residence Inn by Marriott has over 600 locations throughout the U.S. and Canada. Rates vary by location, but I have found some to be surprisingly low. Select locations also welcome pets. Use the hotel finder to search for locations closest to your destination and to see a description and photos of specific Residence Inn locations.